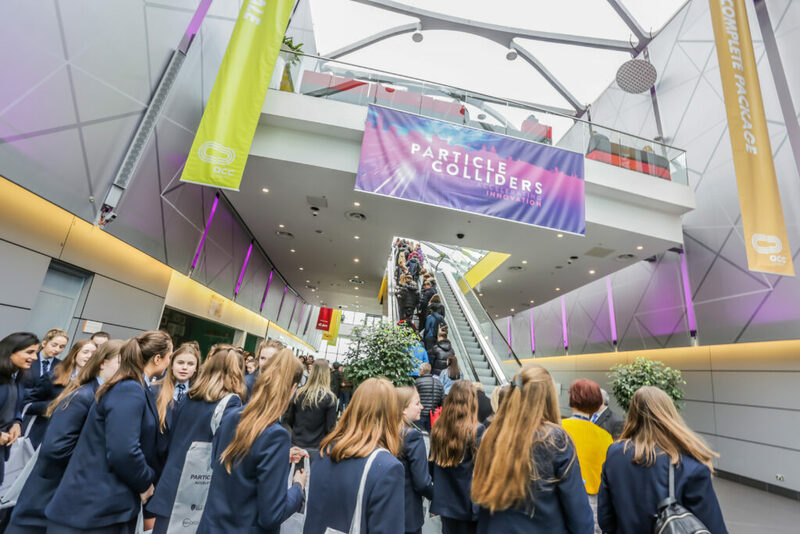 The Symposium “Particle Colliders – Accelerating Innovation” took place at Arena and Convention Centre Liverpool. Future particle accelerators are expected to have a similarly bold impact on science and society. 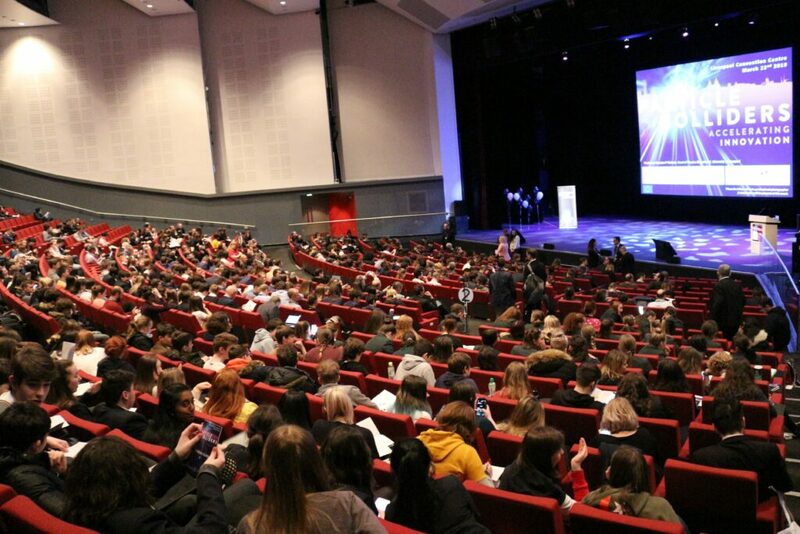 To showcase and the discuss the technologies that are currently being developed within the global Future Circular Collider (FCC) study, almost 1,000 researchers and industrialists from across Europe, university students and high school children participated in “Particle Colliders – Accelerating Innovation”, an international science symposium that took place in Liverpool on Friday 22nd March 2019. Almost 1,000 researchers and industrialists from across Europe, university students and high school children participated in the event. The event, which was co-hosted by the University of Liverpool and CERN together with partners from the Future Circular Collider and EuroCirCol projects, including many Cockcroft Institute experts, investigated the opportunities that next generation of colliders can offer to industry, scientists and society. In January 2019, CERN published the conceptual design report for the Future Circular Collider (FCC), a potential successor to the Large Hadron Collider (LHC), which aims to be four times larger and seven times more powerful, enabling it to reach unprecedented energy levels. Prof Jonathan Rowe (Alan Turing Institute) talking about the role data science plays for science. Making the connection between fundamental science and economic value is often difficult to quantify, but air travel is one example of an application that is benefiting from the technologies emerging from accelerator science. Security checks at airports cause stress and delays for passengers and staff. However, improved imaging of luggage and containers, precise identification of liquids, non-destructive testing of the aircraft, greater energy efficiency and rapid communications are just a few examples of real-world industrial applications for accelerator science that promise to make this mode of transport safer and more efficient. Also among the benefits to wider society are medical imaging of proteins and live cells, advances in proton beam cancer therapy and other ways to diagnose and repair tissue damage. In fact the World Wide Web, which recently celebrated its 30th birthday, was invented at CERN to support particle physics experiments and is now an integral part of our daily lives. Further applications are expected to emerge in the coming years and the FCC collaboration demonstrates a novel example of how particle accelerator technology is helping to verify the authenticity of honey in its latest film, Busy Bees and Mighty Magnets. The symposium featured a number of interactive demonstrations for hundreds of high school students. 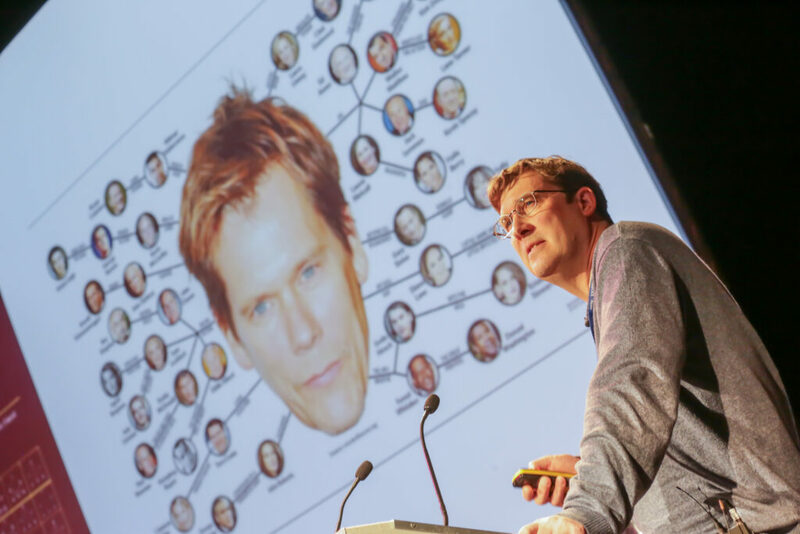 The symposium in Liverpool was live-streamed to institutions across Europe and the talks from world-leading researchers are now available to watch via the event website. 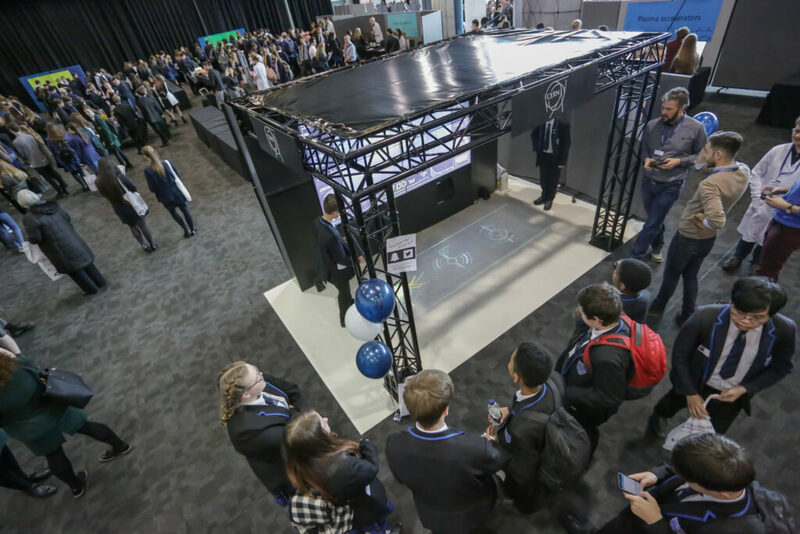 The event featured an industry exhibition with dozens of companies exhibiting their latest products, a careers fair exclusively for Liverpool physics undergraduate students, as well as a number of interactive demonstrations for hundreds of high school students. 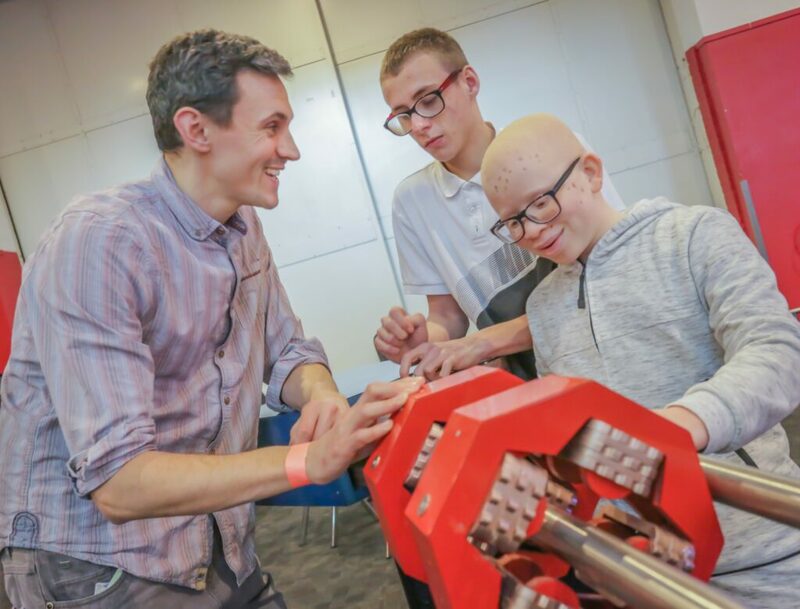 A highlight for the hundreds of visually impaired (CI) and sighted students attending was a demonstration of the world’s first interactive ‘Tactile Collider’, which uses touch together with real sounds from the LHC to create an immersive experience. There was further support on offer to make the event inclusive for VI children e.g. through a narrator in the audience who explained all content shown on slides via Bluetooth headsets – the first time this was offered at an accelerator science event. Delegates also had the chance to play proton football and interact with visualisations of themselves in two different universes within CERN’s interactive Large Hadron Collider Tunnel, which made its UK premiere at the symposium. Tactile Collider allows learners to develop their understanding of accelerators by touch. A technology-transfer workshop followed in the afternoon for industrialists and researchers from across Europe to develop ideas together to solve global challenges. It further strengthened links between industry and academia, and paved the way for future collaborative projects. Several of the working group discussions were chaired by CI members from ASTeC and the University of Liverpool. Oxford-based Adaptix, currently working with the CI in the frame of a joint PhD project and also one of the partners in the CI-led network OMA (Optimization of Medical Accelerators), began life when a problem in search of a solution met a solution in search of a problem. Industry exhibition and Co-Innovation Workshop. Working on laser-driven particle accelerators at University of California, Los Angeles (UCLA), Adaptix co-founder Dr Gil Travish saw the potential to use the emitter arrays he had developed in ‘gene-chips’, to look for DNA unravelling. It was by chance that he was introduced to Mark Evans, who had been looking for a technology to bring radiology to the field and to the bedside. The two men met in a coffeehouse and began a collaboration that is now bringing a product to market. The workshop at the symposium aimed to catalyse these types of interaction. 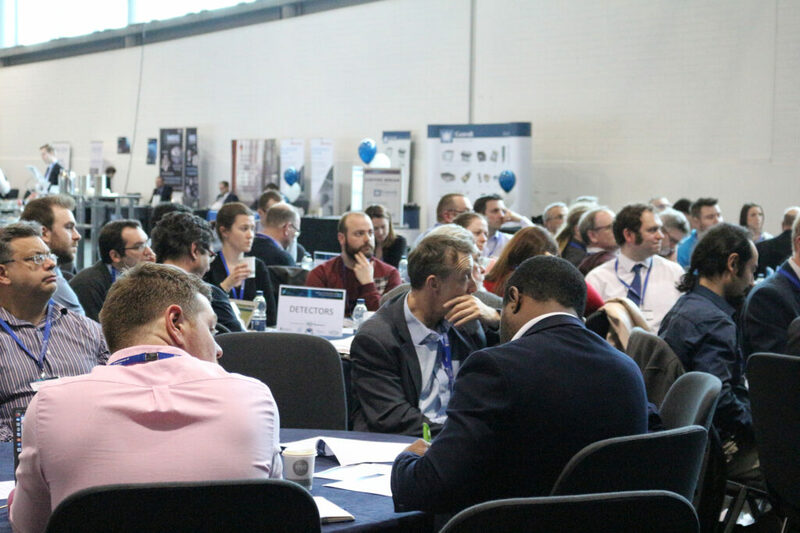 The “Particle Colliders: Accelerating Innovation” symposium was co-hosted by the University of Liverpool and CERN, together with partners from the Future Circular Collider and EuroCirCol projects, on Friday 22 March 2019 at the ACC Liverpool. The Cockcroft Institute was one of the official event sponsors.